Meckel syndrome is a severe autosomal recessive genetic disorder that affects multiple parts of the body. MKS causes liver fibrosis, kidney enlargement with cysts, occipital encephalocele, extra fingers or toes, nervous system abnormalities, respiratory issues, and physical development issues. The triad of occipital encephalocele, large polycystic kidneys, and postaxial polydactyly characterize Meckel syndrome. In the event of live birth, affected infants can live for several months; however, most infants with Meckel syndrome survive for only a short time after birth. Meckel syndrome is caused by one or more mutations in one of at least eight known genes: B9D1, B9D2, CC2D2A, CEP290, MKS1, RPGRIP1L, TMEM216, and TMEM67. Mutations in one of these genes are responsible for about 75% of all known cases of MKS. The cause for the other 25% of cases is unknown. As it is an autosomal recessive gene, an individual must inherit one copy of the mutation from each parent (homozygous) to express the traits of Meckel syndrome. Parent carriers with one copy of the mutation (heterozygous) do not have Meckel syndrome. 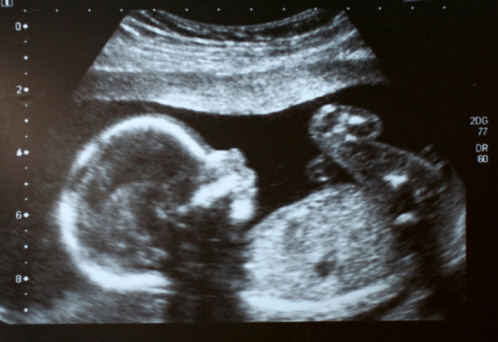 A prenatal ultrasound can detect Meckel syndrome early in the second trimester of pregnancy. If there is no known family history of Meckel syndrome, an ultrasound cannot confirm a diagnosis. At risk families can combine ultrasound with blood tests or amniotic fluid tests for early detection. At- risk carrier parents have a 1 in 4 chance of both passing down the mutated gene at the same time. There is no cure or treatment for Meckel syndrome. Surgery can treat encephaloceles, but there are high risks for infection. Liver and kidney abnormalities could require transplantation. Due to the extensive abnormalities associated with Meckel syndrome, the prognosis for affected individuals is poor. At-risk parents should discuss possibilities and options with their doctor. Meckel syndrome affects males and females equally. The mutation is more prominent among certain peoples, such as those of Finnish decent, Belgians, Bedouins, Gujarati Indians, and those of Israeli Jewish descent.